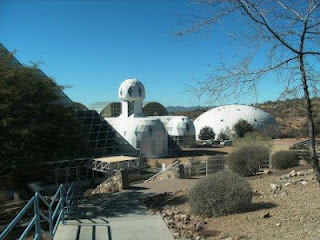 February 11, 2012—Yesterday we went to the earth (Biosphere 2); today we went to the stars (Kitt Observatory). Both were very interesting. Biosphere 2 (biosphere 1 is actually the earth) was a living experiment built in 1991 and then again in 1994. 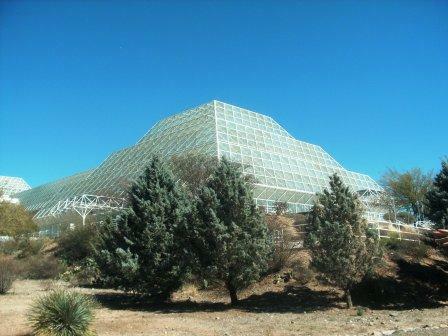 In the first experiment eight scientists were locked up into a self-contained space, where they grew their own food, maintained their environment, and tried not to kill each other. They succeeded in all those things, except that they were really, really happy to get out of the greenhouse on the appointed day. They weren’t too fond of each other. The problem, our tour guide told us, was that although they had enough nutrients to keep them going, they didn’t have enough calories to keep them satisfied. Consequently they were chronically hunger. Hunger creates crankiness. The second experiment was aborted after several months. (The guide did not elaborate why.) What scientists learned, however, was that any type of mission like this requires multi-skilled people. They need to be farmers, butchers, bakers, and multi-skilled mechanics. They also need to be able to do their scientific work. And they need to be psychologically compatible. That’s a tough assignment to fill. I wonder if NASA will be able to find the right assortment of candidates when it is time to send a colony to the moon or to Mars. One of the most interesting facts I learned was that originally they introduced 200 different types of animal life forms to live alongside the Biospherians. Among the insects were cockroaches. Roaches and ants become overwhelming and had to be managed—without introducing insecticides. Interesting. Today we went to two places: Tohono O’odham Nation Cultural Center and Museum in Topawa, and Kitt Observatory. Both were free, since we did not take a guided tour of the observatory. 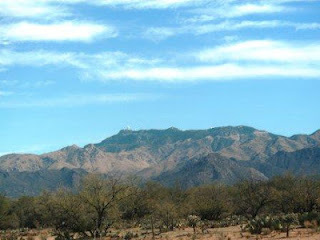 We wondered if we were on the right road, as we were driving to find the Tohono Cultural Center. At one point Garmina (our GPS) stopped producing a map! Apparently, the Indian Reservation road(s) is not on the map. We kept going, and eventually we did find the cultural center. We enjoyed the visit. 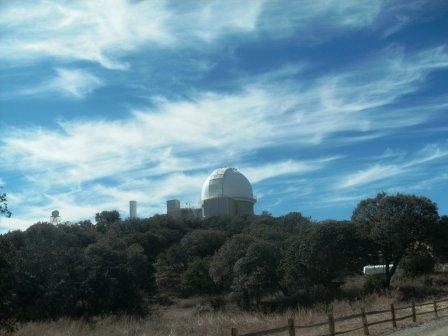 After the cultural center, we headed back and turned onto the road up to Kitt Observatory. I remember that road from when I visited it with Mom and Dad. (I may have gone there twice; I’m not sure.) As Jim cautiously drove up the switchback road (12 miles almost straight up, to an elevation of 6,500 feet), I switched between closing my eyes and eyeballing the fantastic scenery. Kitt Observatory can be seen on top of the mountain, miles away. Looking out from the solar observatory. What a view! I really don’t like mountains. They are nice to look at, but not nice to drive in. We were too early for the next tour, so we decided to go the self-directed route. 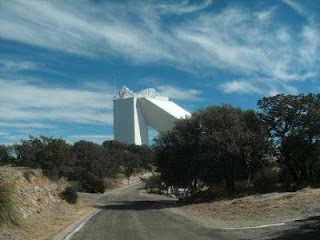 We walked up to one of the observatories and saw the actual telescope. 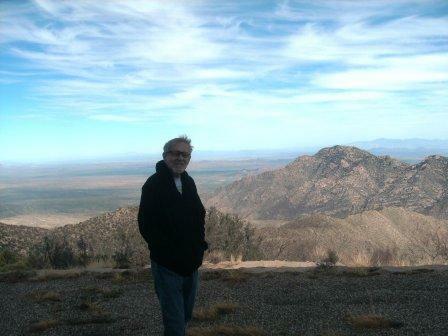 Then we hiked up the mountain to look at the solar observatory. When I say hiked, I mean hiked. Up. The mountain. I’m still breathing hard. 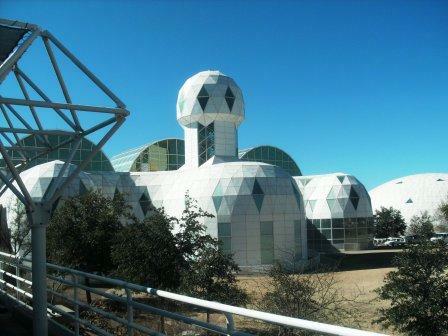 At the solar observatory, we were looking at the pictures on the wall, and through the glass at the laboratory, when an older scientist invited us into the lab. Neat. He explained what he was observing. It didn’t make any sense to me, since I really have no interest in astronomy, but Jim was captivated and pleased that we had an “inside” look.